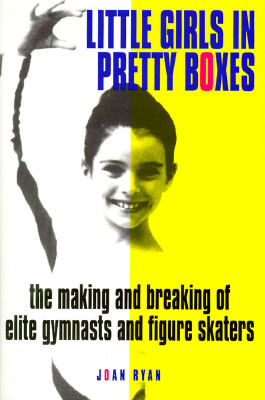 This week we talk to award winning sports journalist Joan Ryan, author of “Little Girls in Pretty Boxes: The Making and Breaking of Elite Gymnasts and Figure Skaters.” Her book debut in 1995 was a controversial, ground-breaking expose that shook the gymnastics community. Ryan brought national attention to the training methods, eating disorders and lack of checks and balances in elite gymnastics. During that time, she was a guest on every major news outlet in the US. Her research forever changed the way gymnasts were trained and perceived by the public. Although she no longer follows the sport professionally, she sat down with us to discuss what her book meant both then and now. Also, the 2012 GymCastic Champions are announced and we discuss the interview and book at length! USA Gymnastics Athlete Welfare Policy. This includes definitions of physical and sexual abuse, screening policies and how to report abuse. Safe for Athletes founded by athletes who were once abused by their coaches, this organization advocates for athlete welfare — striving to provide every athlete with a safe and positive environment free of sexual abuse, bullying and harassment. Kathy Johnson, Betty Okino, Kristie Phillips and parents of Julissa Gomez and Christy Henrich on Oprah with Joan Ryan. Little Girls In Pretty Boxes the movie. Ethan Polson back flip-a-day challenge even with cancer! Special thank you to D Santos for our outro music. Great interview. I especially enjoyed the discussion of the difference between today’s gymnasts and the gymnasts of the ’90s. I agree that the 2012 athletes did seem stronger and happier than those of the 90’s. They seem to be motivated by something other than just fear. I’m wondering if any of you have noticed the difference in the media’s portrayal of these athletes from the 90’s to today. It might have something to do with Joan Ryan’s book or perhaps the changes that happened post-2000. I recently rewatched some of the late 90’s national championships and noted that the term “little girls” was used much more frequently back then than it is now. It wasn’t simply in the fluff pieces either, but as part of the general commentary. Another difference I noticed was the media’s larger focus on the coaches instead of the athletes. The dream was going to the Olympics was the coach’s dream, the coaches appeared on screen with audio much more frequently, and the coaches’ names were used much more often. Today we see the coaches, but the focuses seems to be more on the athletes, rightfully. Look at the fluff’s from the 1994 Nationals…talking about Shannon Miller and Dominique Dawes struggle and fight to hang on to compete two years later…because they would too old. Also, I believe it was the 1993 Nationals Opening fluff, but it was mainly nothing but a montage of the gymnast talking about pain and injuries. So happy to hear this interview…and that you guys represented gym fans that don’t call this book BS…it’s not, and it did help get gymnastics to its current state…hopefully this book will represent the past. My book didn’t have the updated “chapter” in the reprint. What did it say? However, I would love to hear you guys discuss “Chalked Up” and/or interview Jennifer Sey. In my opinion, it seems to have received an even harsher welcome by the gymnastics community. And while I’m sure there are things to be debated, I don’t see how anyone can debate someone’s personal experience. Also, she called the Don Peters scandal before it came out…so it can’t be “all lies”. Before I always thought he was the 1984 Olympic team coach who Bela bullied and eventually ran over (1988 Olympics?!?). Another suggestion…I would love Uncle Tim to review the “Little Girls in Pretty Boxes” film the way he did “American Anthem”! Any film that has a Terri Phillips inspired character that says, “Honey, there ain’t a team without Dana!” deserves his review!!! Finally…So happy to hear you guys thoughts on the 2000 Olympic Team…I wrote an article that was published in “International Gymnast” and I talked about my feelings for those girls. Although I think we all agree this new training system is a good thing (for the unity/bond among the gymnasts more than the actual “verification”), it had to have been hard being the first. And who knows if what they had at that time was anything like the current system. What I remember most came 4 years later…Every gymnastics competition started with a fluff that praised 1996, and then painted 2000 as a huge failure, which lead to a re-vamp of the training system, ect. And that may be NBC, as opposed to USAG, but 4th place is hardly a failure…especially how they performed in finals!!! Another potential topic I’d love for you guys to discuss is NCAA eligibility with Gymnastics. I (sort of) understand the reasoning…if you make money as an athlete, perhaps another athlete could use the scholarship funds more. Although I would like to know the official reason. I mean, say a football player has made money while in H.S., but isn’t good enough for the NFL at the moment, why wouldn’t you want them on your team? But why couldn’t Jordyn Wieber compete for UCLA without a scholarship? I don’t see the harm, nor with any other sport without a true professional rank. I would think that if she had that option she would take it. Same for possibly Kerri Strug. On the flip side, Terin Humphrey, Courtney Kupets and Courtney McCool were all on the 2004 Olympic Team and had the opportunity to go on the Olympic Tour…Same for Sloan and Peszek in 2008. If they took the money, why couldn’t they pay their tuition and still compete? Are there ways to put the money aside or something (a trust perhaps?) and still obtain eligibility? Basically, I just think it’s a shame for Women’s gymnastics because the majority are going to reach their highest level…and as a result receieve the largest amount of professional opportunities that come their way BEFORE they reach the traditional college age (18/19). Most other sports (including Men’s Gymnastics) end up the other way. So yeah, what harm would it do to allow Jordyn Wieber or any other professional gymnast to compete NCAA gymnastics if she paid her own way, as there are many NCAA gymnasts who are not on scholarship? I’m sure that more gymnasts would seek the opportunity to become professional and still compete in college should they be allowed to. Great podcast as always- I have been listening since week one but this is my first comment. I found it interesting that Joan Ryan who wrote a book that largely defined the sport for years seems to know very little about the state of it now with the exception of casual Olympic viewing. Really hope you can get one of the 2000 girls on to talk about their experiences- like you guys said, they essentially overthrew Bela and I think that story needs a podcast. I’d also love to hear Kim Zmeskal at some point talking about her range of experiences from 1992 to elite coach. Great podcast and interview. 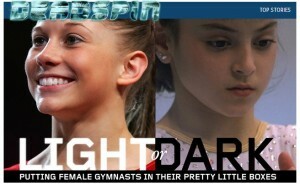 Just reminds me of how dark gymnastics was back in the late eighties and nineties compared to today. The interviewers mentioned the rise of social media and cell phone cameras as something that has promoted transparency in gymnastics thus reducing the abuses. I agree but also think raising the age limit to 16 to qualify for the Olympics (or actually turning 16 by December 31 of the Olympic year) has had a very positive impact. That one year has made a tremendous difference on everybody’s expectations of what our Olympic gymnasts are supposed to look like. Before the age change it was realistic to think we could field an Olympic team of tiny prepubescent gymnasts and we did. Just look at a picture of the 1992 team and you can see what I mean. The result was not only a look of prepubescent girls either on the team or trying to make it, but girls already in puberty trying to make the team by maintain prepubescent weight ranges, something nearly impossible to do and a prescription for eating and emotional disorders. When the age limit was raised a year it was simply not realistic to think we could field a team of prepubescent gymnasts so that no longer became the prevailing expectation. Look at the 2012 team – a group of happy girls who, while still in outstanding shape, have mature, healthy looking bodies. Whoa Betty Okino is so defensive on Oprah, wonder what she is hiding. So. Much. Word. Vomit. Master Manipulator indeed.